Here you will find a full range with an industrial standard noise dose meter to suit every requirement. With the portable noise dose meter you cancarry out measurements quickly to gain control of a situation or to set the device to take timed measurements. The noise dose meter is important for all industries, especially by using it as a mobile device which is able to assess office stress levels or street noise levels. Often problems arise from noisy neighbours or if bars and restaurants are in residential areas and produce noise levels after 10pm in excess of what local laws permit. 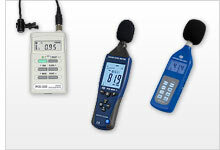 We, of course, can assess which noise dose meter you require in relation to the issue you have and the relating laws. We also have microphone extension cords, tripods, calibrators and calibration certificates for most models of noise dose meter. The Noise Dose Meter PCE-MSL 1 is a simple sound measuring device. The PCE-MSL 1 noise dose meter is used to quickly determine the ambient noise level. In addition to the volume measurement, the PCE-MSL 1 noise dose meter also has the option of determining the ambient temperature. The measurement of background noise is important in almost every situation today. PCE-353 is a sound level meter, sound pressure level (SPL) meter, decibel (dB) meter, noise meter or noise dose meter used for acoustic measurements. With this meter, you are able to measure sound exposure level (SEL) as well as equivalent continuous sound level (Leq), , measurements commonly used in assessing industrial noise. The noise dose meter PCE-322ALEQ is particularly suitable for measuring noise in the field of industrial, health, safety and environmental monitoring. The PCE-322ALEQ noise dose meter has a logger function, which allows storage of up to 32700 readings. The noise dose meter PCE-322A is particularly suitable for measuring noise in the field of industrial, health, safety and environmental monitoring. The PCE-322A noise dose meter has a logger function, which allows storage of up to 32700 readings. The noise dose meter PCE-MSM 4 has features that you will only find in other more expensive devices. The noise dose meter in a slim design is ideal for mobile measurements of sound. The noise dose meter PCE-MSM 4 has features that you will only find in other more expensive devices. The class 2 noise dose meter in a slim design is ideal for mobile measurements of sound. It is not easy to find an instrument of this level for such a low price. PCE-428 is a class 2 data-logging noise dose meter that meets IEC 60651:1979, IEC 60804:2000, IEC 61672-1:2013, ANSI S1.4-1983 and ANSI S1.43-1997 requirements. This portable high-accuracy sound level meter has a large easy-to-read illuminated LCD screen that displays the sound pressure level (SPL) numerically and graphically in real time. PCE-430 is a class 1 data-logging noise dose meter that meets IEC 60651:1979, IEC 60804:2000, IEC 61672-1:2013, ANSI S1.4-1983 and ANSI S1.43-1997 requirements. This portable high-accuracy sound level meter has a large easy-to-read illuminated LCD screen that displays the sound pressure level (SPL) numerically and graphically in real time. The Class 1 outdoor noise dose meter PCE-430-EKIT with integrated data logger meets all requirements for noise measurement and frequency analysis. This integrated precision pulse outdoor noise dose meter kit follows all valid standards and guidelines, and is designed for use outdoors in all weather. The typical applications for this instrument are the measurement of workplace noise, compliance, environmental noise detection, selection of hearing protector selection, selection of appropriate noise abatement measures and noise exposure estimation. PCE-432 is a class 1 data-logging noise dose meter that meets IEC 60651:1979, IEC 60804:2000, IEC 61672-1:2013, ANSI S1.4-1983 and ANSI S1.43-1997 requirements. This portable high-accuracy sound level meter is equipped with GPS functionality, allowing measured values to be assigned to an exact geographic location. The Class 1 outdoor noise dose meter PCE-432-EKIT can be used, e.g, for sound measurement of street noise, aircraft and train noise, event noise, noise coming from construction sites, ports, factories involving heavy machinery, airport/bus stations, stadiums, horse/motor racing tracks etc. The weather conditions do not matter, and hail, snow, rain and similar are no problem for this system for outdoor noise monitoring. The outdoor noise dose meter is equipped with a GPS receiver which allows the user to assign the measured values to an exact position. PCE-NDL 10 is a high-quality noise dose meter or sound level meter with data logging capabilities. This noise dosimeter records sound pressure level (SPL) measurements as well as dosimetry (dose) measurements in decibels (dB) and saves the measurement data to the internal memory, which can then be transferred to an SD card (SD card included). PCE-EM 886 is a portable handheld multifunctional digital sound meter used to measure sound, light, humidity, temperature, AC / DC current, electrical resistance, capacitance and frequency. PCE-EM 882 is a portable, handheld, multifunctional digital sound meter capable of measuring four different physical parameters. An ideal tool for use in industrial hygiene, HVAC performance assessment and environmental condition monitoring applications, this easy-to-use measuring instrument includes sensors for measuring sound, light, temperature and relative humidity. The outdoor noise dose meter PCE-428-EKIT, from the field of environmental measurement technology, is an optimal noise dose meter for measurements at workplaces, construction sites, in traffic, airports, etc. The outdoor noise dose meter is a class 2 device and is equipped with an octave band frequency filter. Optionally, the outdoor noise dose meter PCE-428-EKIT can be upgraded with a 1/3 octave band filter. The additional kit for outdoor sound measurement makes it possible to measure outdoor noise with a noise dose meter over a long period of time, even in the rain.